Annalise is listening to the tape that Stonie made for her via her headphones. Sam comes in and disturbs her, asking about dinner. Annalise is very distracted, and then says that she can't stay to eat. Annalise tells him that she's going out to Suzie's and he offers to join her, but she brushes him off, telling him that it's a girls thing. She leaves, and things are obviously very awkward between them. Susan asks Brett if he was scared. He says he wasn't, as a warrior is afraid of nothing(!) ...and then admits that he was petrified, least he was at first. Brett says that he felt totally safe with the guys. BRETT: Everything was so unreal, yet it was real at the same time, know what I mean? Er, not really, Brett, no. Susan appears to though, so all is well. Susan says she had an amazing night too, and recommends that Brett spend a night in one of the huts too so he can see for himself. Rachel comes over and says that although she'll tag along today, she'll stay behind at the camp for another night, so she might not meet up with Brett and Susan again. She asks Brett if he's looking forward to meeting the young boy that he's sponsoring, but Brett's mind is still on the warriors. Rachel reckons that the men have been filling Brett's head with nonsense, as all they think about is chasing girls and hunting. Brett thinks that sounds pretty good - and comments that all of the girls love them. Girls? I think Brett's the one with the crush! Mark tells Cody that in life, your dreams can come true but when they do, there's a price to pay. It turns out that he got the job - it's great pay, great hours and fantastic people...but the show might only last one season and he'll have to leave Erinsborough as it'll be filmed in Sydney. Cody tells him that Sydney is a great place, and she's already found a new flatmate - Jen's moving in! Mark's a little overwhelmed at how many changes are occurring so quickly. He admits that the last 6 months have been horrible for him, and he thought he wouldn't recover from it. He feels like he's been given a second chance. They happily hug. Philip is pacing and Helen is hugging Hannah, who's clearly upset. Jen and Luke come out of the main bedroom with all of Jen's things packed away. Hannah gets up and begs Jen not to leave. She tells Jen that Philip didn't mean what he said, and that he still loves her. She begs Philip to tell Jen to stay, but he walks out into the kitchen. Helen looks pained. HANNAH: I hate him sending you away. Jen tells Hannah that the situation isn't Philip's fault - things just didn't work out between them. Jen tells her that she still loves Hannah, and nothing will change that. Hannah says that she loves Jen too and they hug. Jen shoots a 'Oh dear' look over at Helen, and Helen gets Hannah out of the embrace. Philip comes back in to hear Jen apologising to Helen. 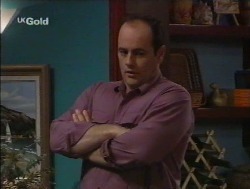 Helen tells her to take care, and Luke suggests that they leave. They go, and Jen pauses in the doorway and she and Philip stare at each other for a while. Hannah runs off in tears and eventually, Helen follows her. Philip stands by himself, with his arms folded and he sighs. Sam and Luke are at the bar. Luke tells Sam that watching Jen move out was awful as she was a mess. Sam has clearly had a few beers and when Luke voices concern about Jen, Sam tells him to back and be with her - he can drink alone anyway. Luke thinks that Cody will give her the sympathy that she needs, but he can't do it. SAM: Problems of your own, eh? LUKE: No, it's not that. I'm just so angry with her. See, when things go bad for Jen, she runs away. She lies to everyone, including herself. Anything other than admit she's infallible. SAM: She's a proud woman. LUKE: (forcefully) She's a quitter. And now she's hurting others. Philip and her had a really good relationship and you should always fight for the good ones. Sam sighs - this has clearly touched a nerve! Sam tells him that it's not always that easy. Luke asks if Sam thinks he's being too harsh, and then reveals that he has to be harsh, because he's exactly like Jen himself. Sam asks what Luke's going to do - is he going to be able to live with Hannah and Helen after everything that's happened? Luke thinks that he might go to Number 30, as Mark's departure will mean there's enough room even though Jen's moving in. Luke thinks that if he stays at 26 or goes to 30, there'll be tension. He asks if there's any room for him at 24 with Sam. SAM: (ruefully) You don't want to be there either. Trust me. Philip is sitting alone in the darkened living room in silence. A knock comes at the door and he leaps up to answer it. Philip is stunned to see his son on the doorstep. Michael wonders if he's ok, but Philip tells him it's nothing. He happily embraces his son, and Michael looks concerned. Brett plays soccer with the kid that he's sponsoring. Brett comments that he's a very shy child, but he comes out of himself when he's kicking the ball around. 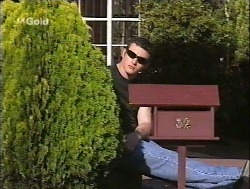 There's lots of footage of where the lad lives and Scott takes some photographs. Brett discusses the food, and how they grow maize so there's an addition to the traditional Maasai diet of milk, meat and cow's blood. Susan and Brett go to a school, and Brett reveals that 300 to 500 kids are sponsored by Australians, so that makes Australians fairly popular in the region. Brett says that it's always bothered him that the siblings of sponsored kids might feel left out, but now he's been able to see for himself how it works. He says that the few bucks that Australians send over each month goes a long way, and not just the children concerned benefit - the whole community does. The schoolkids sing and Brett and Susan listen. When they've finished, Susan addresses them in their language and thanks them for their welcome and for allowing them to visit. She tells them that she's a teacher back in Australia, so she understands what a school needs to help the kids for the rest of their lives. When she's finished talking, they start singing again. Philip and Michael are in the kitchen with a cuppa. PHILIP: Suppose I should be grateful for small mercies. She helped me get over Julie, she made me feel good about myself, she was *so* good with Hannah. He affects a German accent. PHILIP: Her verk here vas done! They both laugh. Michael reckons Philip probably did a lot for Jen too. 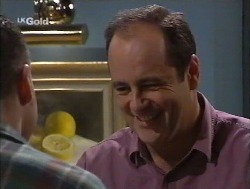 Philip tells him how he thought that they were meant for each other and nothing could break them up. Michael asks what did and Philip said that Jen was the one who did it - she didn't trust his love enough to be honest with him. Philip snaps out of it and apologises to Michael for having to deal with all of this when he's just arrived home. He tells him that he's very pleased to see him. PHILIP: We'll have a great Christmas. My family's around me - I'm a lucky man. Michael smiles and they chink their cups together. Philip, Helen, Michael and Hannah are all sitting together eating breakfast. Philip mentions that he's seen an ad for a carol service and thinks that they could all go along together as a family to get in the spirit for Christmas. HANNAH: (coldly) Then I think I'll pass. Everyone sighs a bit and Helen tries to gee Hannah along. Hannah miserably thinks that it doesn't feel like Christmas. MICHAEL: Hey squirt, I bought you two presents this year. Do you want to open one of them now? HANNAH: No thanks. And I'm not really a squirt any more. 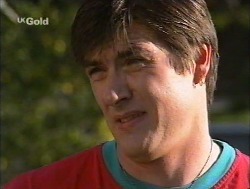 Philip puts down his spoon in annoyance and tells Hannah that although he realises it's hard on her, she has to come to terms with the fact that Jen doesn't live with them any more. Hannah clings to the hope that Jen might return, but Philip tells her that loving someone isn't always enough. Hannah thinks it should be. Fortunately, Luke interrupts everyone with his packed bag. He announces that he's going to Number 30 and Helen and Philip try to reassure him that he's fine to carry on living at 26 if he wishes. HANNAH: (pointedly) Well, he has to be with Jen, Dad. She'll be lonely without any family around. Especially at Christmas. She leaves the breakfast table. Philip doesn't look amused. It seems like Hannah's getting more like Julie every day! Danni and Mal come out of 22 and check the mailbox. Danni spots Stonefish hiding behind the mailbox of 32 and shouts over. DANNI: Hey! Thought you weren't hanging out for results, Mr Confident?! STONIE: Are results coming out today? I'd forgotten completely! Nah, nah, nah, I was just out enjoying the morning sun! MAL: Yeah, well, the sunshine never got you out of bed this early before, Stonefish! He admits that he's been up all night. Danni and Mal tell him he's not the only one. Mal suggests that they all open their results together. Stonie thinks that Danni and Mal should come over to 32 and they can have a mass celebration. Danni worries it might be a commiseration! Scouse appears and calls Stonie over. Stonie tells Danni and Mal not to peek at their results until they arrive at his. He runs over to meet Scouse and Danni and Mal go back inside. Scouse tells Stonie that he dropped over to see how his tape went down with Annalise. Stonie says that she probably hasn't had a chance to listen to it. Scouse shakes his head and tells him that she's listened to it. Stonie doesn't accept this and reckons that even if she has, she won't come racing over - girls play hard to get. Scouse thinks she's not interested, but Stonie thinks that she will come around. SCOUSE: Mate, if that song hasn't done the trick by now, nothing will. Rachel mentions that the Maasai don't have a history of growing crops. It's explained that World Vision provide them with the seeds, tools and fertilisers so that they can grow food to eat - and the results so far have been positive. Susan walks through a graveyard alone and looks around. Susan is walking through a graveyard in Australia. She comes across a teenager who is carrying some flowers. Susan walks behind her. The teenager starts to cry, and Susan catches up with her. 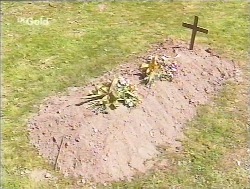 The teenager tells Susan that she's visiting her mother's grave and asks if Susan's mother is alive. SUSAN: No, she died a long time ago. Did your mother die a long time ago? TEENAGER: (shakes head) A couple of weeks. The teenager nods and walks to her mother's grave. Susan calls after her and says that she knows how the teenager is feeling. The teenager insists that she doesn't - nobody does. She talks about how nobody would be able to accept what happened. Susan questions her, but the teenager tells her it doesn't matter. SUSAN: I should introduce myself. My name's Susan. TEENAGER: Mine too. Susan Smith. SUSAN: This is my mother's! 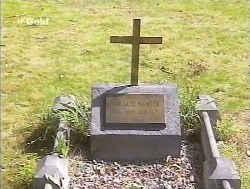 Susan stares at the grave in puzzlement and then turns to look at the teenager, but she's disappeared. Susan looks around in bewilderment. Rachel is calling Susan's name, and we're back in the African graveyard. Eventually, Susan responds and says that she'd like to sponsor a child - by herself, and preferably a girl. Rachel says that can be arranged, and she knows just the child. Susan says that she'd love to meet her. Susan and Rachel go to meet the child who Susan will sponsor. Susan waits at a distance as Rachel speaks to the child. When she stops speaking, the child sprints to Susan and dives into her arms. The pair hug each other tightly. Mal, Danni and Stonie all have their exam results. They all stand around for a while, and in the end, Angie says that she'll open them! They grab them away from her and open them on the count of 3. Mal is the first to read his, and whoops with delight. Stonie soon joins him and is proud to announce that he got an A in English. Angie celebrates with Stonie and Mal suddenly realises that Danni is silent. He goes over to her and she's gutted as she's failed every subject.